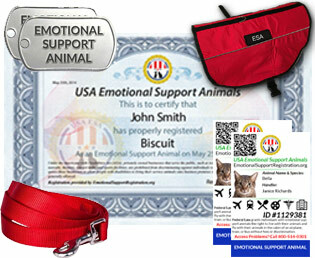 Make your life easier for you and your emotional support animal! Eliminate hassle and questioning of your emotional support animal and travel in peace. 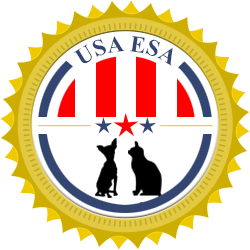 Registration products from USA ESA help you bring your dog, cat, or other ESA with you in the cabin of the airplane, in hotels or housing units with reduced questioning and less hassle! We understand that your ESA is an important and trusted companion in your daily life. Having ESA ID cards with your ESA letter can help end the hassle and questioning once and for all. We hope that you use our registration service responsibly and for the purpose with which it is intended. This is a powerful service that changes lives every day. 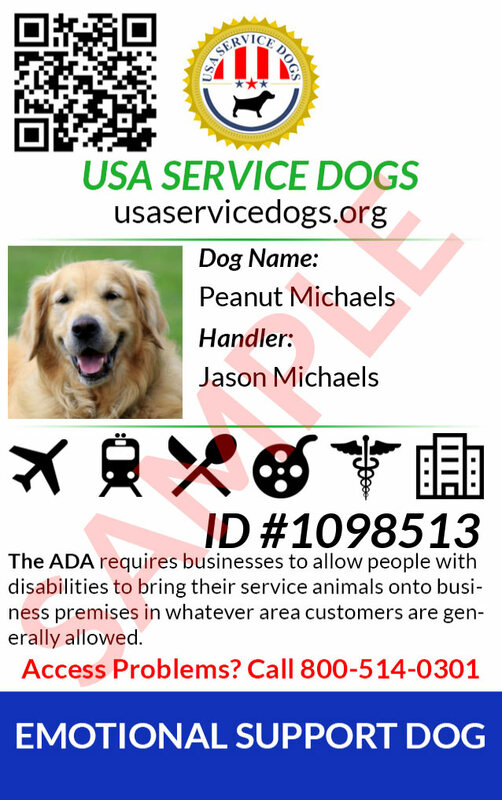 Sample Official ID cards from USA ESA allow easier public access and instant recognition. Under the Air Carrier Access Act, people with disabilities who require the presence of an ESA are allowed to bring their ESAs with them into aircraft cabin without paying extra fees or requiring their ESA to be in a carrier case. Under the Fair Housing Act, people with disabilities who require the presence of an ESA must be accommodated to allow their ESA with them into housing, without extra fees and pet deposits, even in establishments that forbid pets. Any animal / breed is acceptable! The law does not distinguish based on the species, breed or size of animal - any animal can be an emotional support animal! Emotional support animals do not need specialized training while service dogs may be trained in their task by professionals or their owners. The ACAA and FHA takes precedence over local laws or business policies, so you can travel with your emotional support animal knowing that your rights are protected in all 50 states. Other conditions that qualify for emotional support animals include anxiety disorders, panic attacks, social phobias, fear of flying, among many others. Emotional support animals are there for companionship and are not required to be trained in a specific task, other than offering you unconditional love. 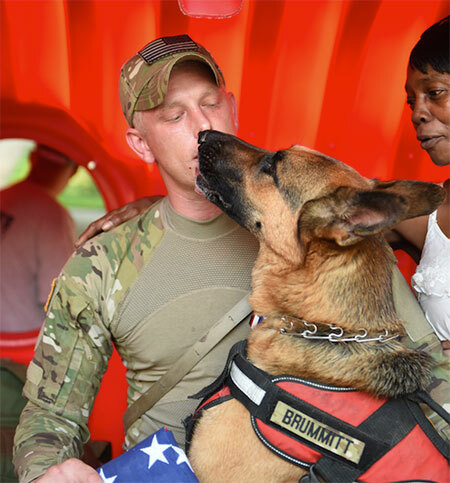 We proudly donate a portion of our proceeds to Paws for Veterans, a phenomenal organization which rescues dogs from shelters and unites them with our heroes returning from war who may suffer from PTSD. We offer instant electronic (printable) ID cards, physical ID cards, ESA vests, ESA tags, ESA leashes, and registration certificates in convenient kits for all your needs. 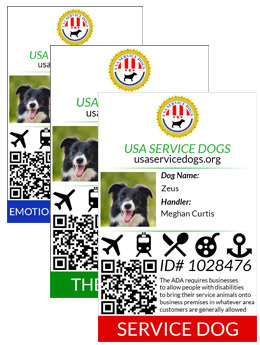 With electronic ID cards, identifiable ESA vests, leashes, and tags from USA ESA, you can be on your way in as little as 5 minutes to an easier life with your emotional support animal. Registration at USA ESA never expires and is good for the lifetime of your ESA. Express shipping of vests, certificates, and physical ID cards is available. 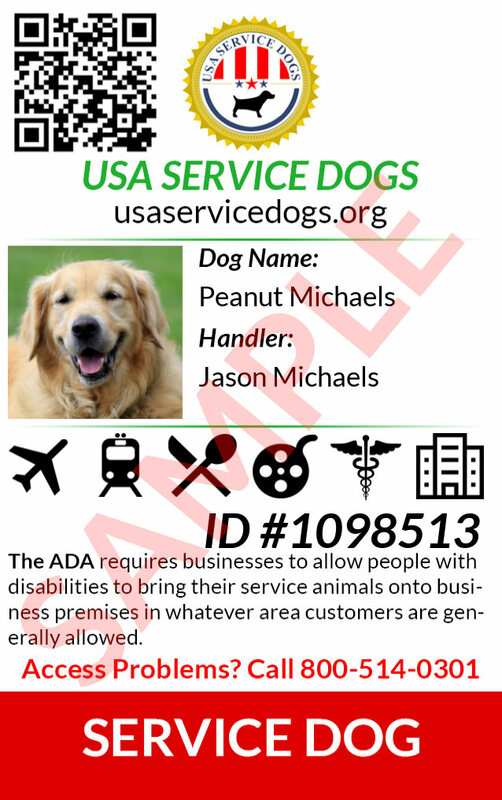 We also offer physical ID cards and identifiable vests, tags, and leashes to help you achieve a hassle free experience bringing your ESA with you in airlines, hotels, and housing. Questions? We're here to help. Send us an email at orders@EmotionalSupportRegistration.org and we'll get back to you sooner than you think!